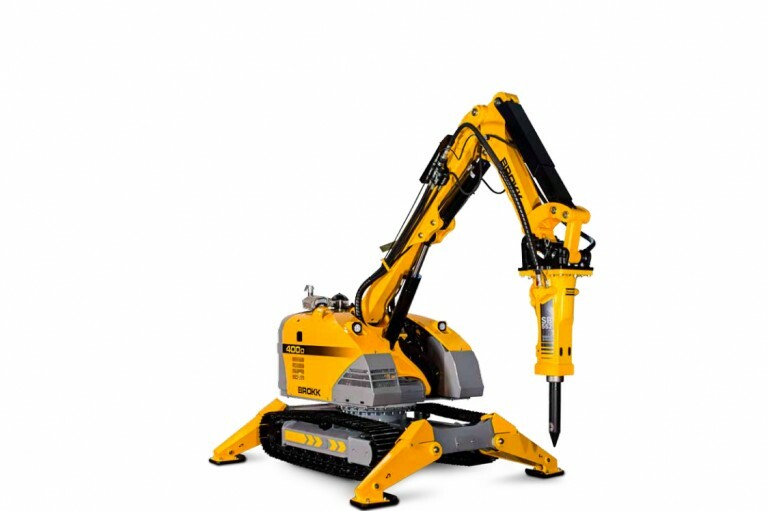 The bigger, stronger and faster demolition robot, Brokk 400D, is yet another impressive step forward for diesel-driven demolition machines - perfect for heavy-duty demolition in places that lack power supply. It outperforms conventional excavators several times heavier with both its breaking power and the ability to get into tight spaces. The Brokk 400D offers an array of new advantages to the Brokk family. It is the fastest Brokk machine ever, more than 60% faster than other Brokk machines, making it quick and easy to move between work stations or travel longer distances. And the speedier movements increases productivity once at the work site. The Brokk 400D features a new, powerful diesel engine, as well as a new undercarriage design that provides an even greater machine stability. To top it all off, the Brokk 400D has longer reach, carries heavier tools and delivers a mighty punch with the bigger hammer that has the potential to even outshine its electric sibling.